Oh, If Only . . . .
A couple of days ago I did a quick breeze-through of the office-supply section of a Value Village thrift store. For some reason, in amongst the legal pad portfolios and the staplers and the outdated day-planners, someone had plopped this Jumbo Universal Remote. When I saw what it was, clearly labeled below my thumb, I indulged in a few seconds of wistful fantasy. 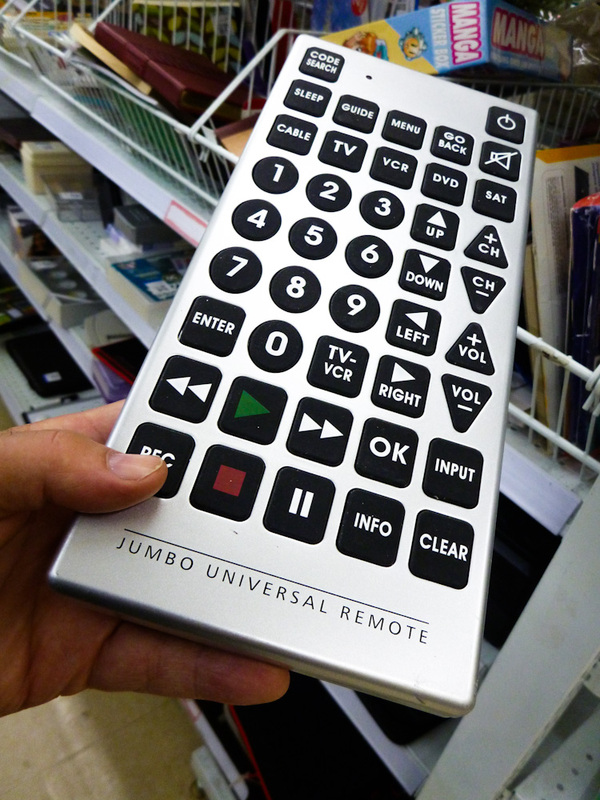 Wouldn’t it be wonderful if we actually did have a Universal Remote for our lives? Wouldn’t it be great to push the button up there at the top, and get more Sleep? And wouldn’t it be nice to push Guide and a personal life coach would magically appear? And when we really messed something up, wouldn’t a Go Back button be useful? And when the noise of life got too loud, what a relief a mute button would be. And if our mood was too low, an Up button would be helpful, as would the Down button if we were unrealistically euphoric. And to reassure ourselves of our validity, we could push a simple OK.
And there’s the Sat button. I’m assuming in the TV tech world this stands for “satellite,” but maybe it could remind us about God precious sanity-restoring gift of the Sabbath. Anyway, you get the idea. Our 750,000-word Bibles are like a Jumbo Universal Remote, which work in any part of the world to guide us to our Creator. Want a review of Bible texts which talk about the Bible itself? Click the link just below.